You are browsing the archive for Board. This blog post is a slightly revised cross-post of an posting that was part of the series featuring chapter updates from across the Open Knowledge Network and was written by the team of Open Knowledge Finland. Summer was a great time in Finland. However, there was no time for extended holidays at Open Knowledge Finland – we had a very busy summer. Here is our update for the Open Knowledge Network, with key news from the last few months. Open Knowledge Finland has a new board in action since June! In a bit of old news, one of the most important yeary news was our annual meeting back in May. OKFFI held its annual meeting on Monday May 30 at the Helsinki office. Nearly 40 people (well over 10% of members) attended face-to-face or online – quite a good number, in fact! Pic: May 30, 2016 – Annual General Meeting post-celebration Antti ‘Jogi’ Poikola was unanimously selected to continue as the chairman. 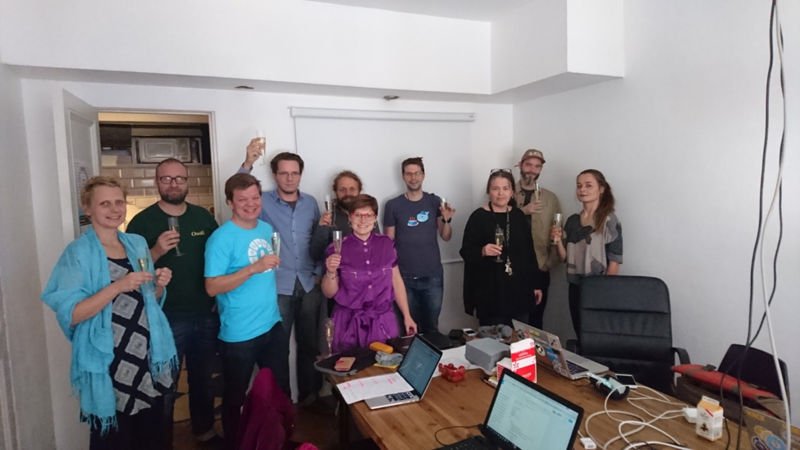 The new board consists of 3 old members (Jogi, as well as Lilli Linkola and Mika Honkanen) and no less than 5 new members – Susanna Ånäs, Liisi Soroush, Raoul Plommer, Mikael Seppälä and Jessica Parland-von Essen. In its first meeting, each board member was assigned a primary and secondary role as follows: Antti Poikola – chairman and web communications Mika Honkanen – vice chairman and 2nd treasurer Lilli Linkola – secretary and working group contact Mikael Seppälä – treasurer and working group contact Raoul Plommer – web communications and tools and international relations Susanna Ånäs – internal communications and international relations Liisi Soroush – collaboration networks and member secretary Jessica Parland-von Essen – external communications and collaboration networks Pic: New board (+ non-board Teemu and Jaakko), having an open board meeting in September. With the new board, it is nice to see the gender split is at 50-50. It is also a great sign that there are a lot of people who want to apply for the board (13 candidates) and that we have great new people aboard to help steer the community. Congratulations and good luck to the board! 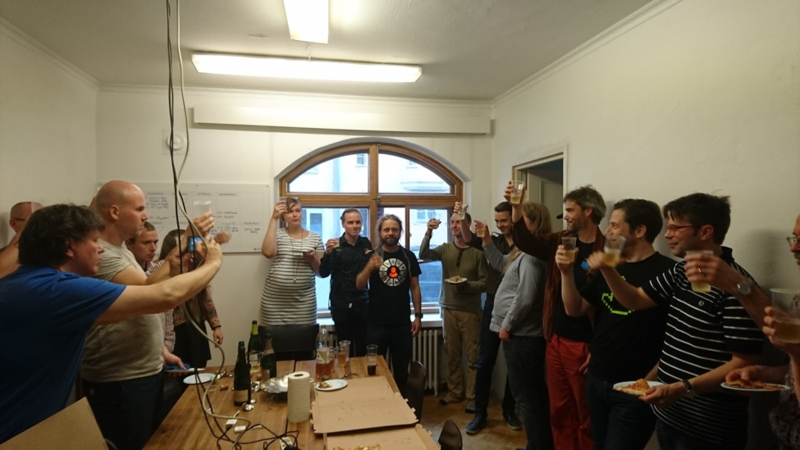 Open Knowledge Finland is growing! Currently, 8 people are employed by Open Knowledge Finland. However, this number will soon decrease slightly as projects are ending. For this year, we have had a number of new people joining us – Emilia Hjelm, John Sperryn, Konsta Happonen. Previously active members like Heidi Laine, Mika Honkanen have received part-time contracts. On average, we have about 4-5 FTE in staff. In terms of finances, we have managed to grow at a good pace – from just under 200k eur in 2014, to about 300k eur in 2015 – and still on the rise, a total of nearly 500 000 eur in total turnover expected in 2016. The funding is short-term, fragmented and diverse – which is both exciting as well as a cause of concern (for longer term planning). Open Knowledge Finland currently has over 350 members – and hosts an Open Knowledge Network of nearly 4000 people in Finland. 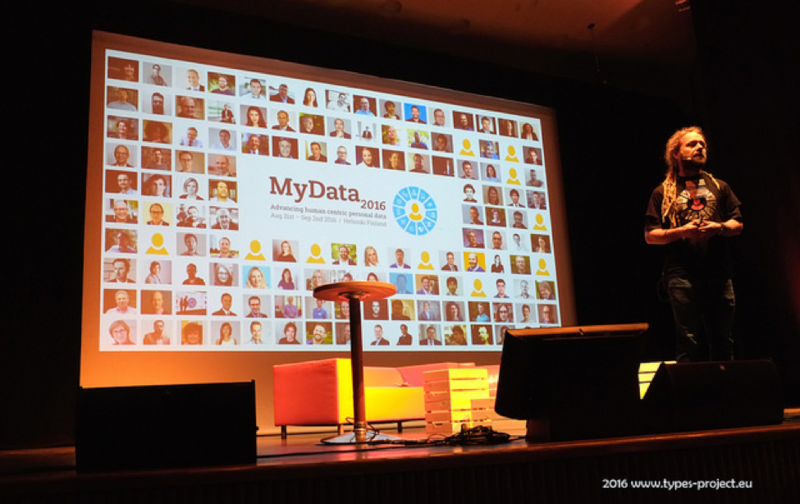 Pic: Chairman and MyData activist & researcher Jogi Poikola at MyData 2016 introduction. 2016 is the year of MyData. Open Knowledge Finland is all about the free flow of information. Open data, open knowledge, open collaboration – and, we believe this also includes free (user-controlled) flow of personal information. The MyData movement encompasses concepts and tools not only to build more transparent societies – but also to develop effective services and create new business in the digital domain. Actions around the MyData conceptual framework represents the BIGGEST concentration of effort for us this year. In particular, Open Knowledge Finland’s key actions for the fall of 2016 were geared towards the MyData 2016 conference (31 Aug – 2 Sep) and the Ultrahack MyData hackathon running in parallel with the conference. Pic: Ultrahack 2015 – one of the highlights of that year. Intense hacking on smart cities & civic tech in the picture. We had some 700 visitors in total – over 500 conference visitors, over 100 hackers or hack visitors, over 30 partner organisations involved. Amazingly, we had 140+ speakers, in 40+ sessions. Visitors came from about 30 countries. The feedback has been excellent – a great results for a first-timer conference! Check out the event images on the Flickr pool: https://www.flickr.com/groups/mydata2016. Conference video archive is available at http://goo.gl/gV9r4c . Please stay tuned to www.mydata2016.org and @mydata2016 on Twitter. More wrap-ups and posts to follow. And yes, MyData 2017 is on the drawing board! In addition to MyData, many of our 9 working groups have interesting ongoing projects, ranging in size, duration and scope. In a nutshell, here are a few of the active ones: The 3 year EU project “D-CENT” (Democracy WG) is wrapping up soon. D-CENT is a Europe-wide project creating privacy-aware tools and applications for direct democracy and economic empowerment. Together with citizens and developers, we are creating a decentralised social networking platform for large-scale collaboration and decision-making. Contact : Jaakko@okf.fi Yhtäköyttä (Democracy WG), “Common knowledge practices in research and decision-making”, is our first project for he Finnish Government’s analysis and assessment of research activities (VN TEAS) coordinated by the Prime Minister’s Office (VNK). The aim of the project is to find out what kind of tools and methods could be used in government in order to utilize knowledge management and research data better and to improve evidence-based decision making. This project will involve theoretical study, 30+ interviews and 4 experiments in new tools and methods such as data visualization, open impact assessment, real-time document editing, real-time fact-checking. 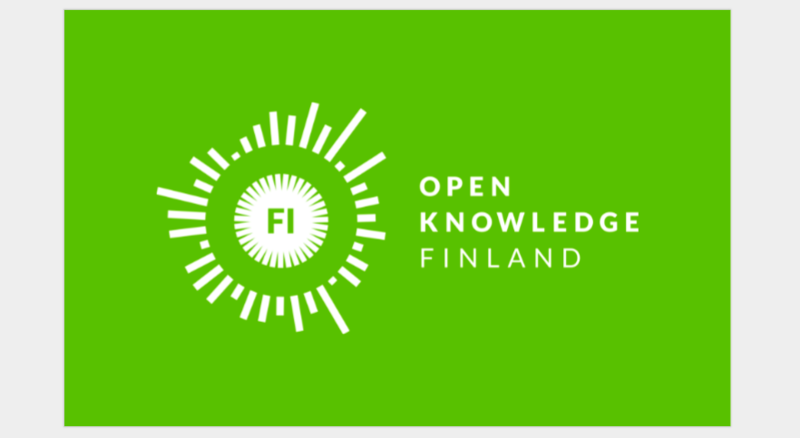 Contact: raimo.muurinen@okf.fi Cost-effective utilization of open data and basic registers: The research project’s goal is to better understand and measure the impacts of open data and the use of the basic public registers. As an outcome, we expect policy recommendations and suggestions for new methods, processes or technical changes to help improve cost-efficient publishing of open data and increase the impact of the basic registers. Contact ; mika.honkanen@okf.fi Open Citizen Science: Citizen science has most notably been used as a method for creating observational data for life science research. Against the backdrop of current technological advancement, we need to create Citizen Science v 2.0 – open, diverse, responsible, dialogic and academically excellent. In terms of outcomes, we envision a set of concrete recommendations for national stakeholders; we willcreate understanding, awareness and discussion about citizen science as a scientific method and a community; and we will catalyze a research agenda for a new kind of open citizen science. Contact: heidi.laine@okf.fi Creative Commons Licensing Support: As Creative Commons licenses are the official recommended license for open data in the Finnish governmental sector, awareness and instructions for using them in practice are needed across many sectors of society, including for public open bids, content creation subcontracting, and data purchasing. Contact: tarmo.toikkanen@okf.fi Other projects…to be updated in the next blog! See also summary of OK Finland projects in a few slides. In October, we will also be having an extraordinary general meeting and plan to change our rules to better accommodate for scaling. Stay tuned – more to follow! Want to get in touch? Contact executive director Teemu Ropponen or one of the board members. Follow us on Twitter or Facebook. The post The summer is long gone – a brief look at past months at Open Knowledge Finland appeared first on Open Knowledge Finland.